My publicist friends at Minotaur books offered me a review e-copy of the latest Molly Murphy mystery and of course I said yes!! I believe I have read all of the other Molly mysteries. I love a historical mystery, and I love reading about New York at the turn of the century. This time, Molly, husband Daniel, and baby Liam are headed out to Connecticut for the holidays at a house filled with sadness from the loss of a child ten years before. Molly herself has recently lost a child through miscarriage and she is still healing. As always, there’s a realness to these characters that make them very believable and easy to relate to. While I do love these books, I did find this wrap-up a bit hard to believe, but I liked it anyway. It’s Christmas time — give me happy endings!! I love both of these authors individually, so you can image my excitement when I saw that they had collaborated on a novel of WWI! 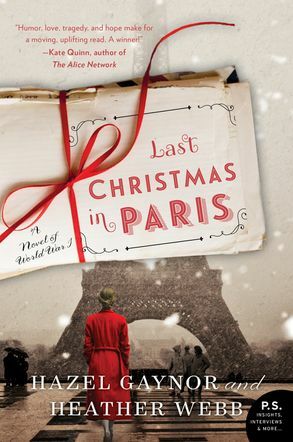 Told primarily through correspondence and telegrams, Last Christmas in Paris tells the story of Evie and Thomas, family friends who have grown up together and who fall in love through their letters during the war. Moving back in forth from the present (well, late 1960’s) to the war, this is a touching story that has a lot of detail and information in it. It makes you ponder the power of the written word and I wonder if a heartfelt letter is truly a thing of the past. It certainly is in danger of extinction! Thank you for my review copy from the publisher via Edelweiss! Highly recommended for this holiday season — and beyond! I also had the distinct opportunity of seeing Heather and Hazel speak at the Concord Bookshop recently for a delightful evening. I love it when authors have the chance to make their work come alive.